It hardly seems possible to begin this review, much less complete it, since my emotions are literally all over the place following The Vampire Diaries Season 7 Episode 13. That? You guys. If ever there's a reason to use the word "epic" this was it. Birth. Death. Heartbreak. Happiness. This hour had absolutely all of that and then some. Maybe it's because I'm a mom. Maybe it's because tiny little babies wrapped in tiny little hospital blankets just make my heart a total mess. Maybe it's the mention of Liz Forbes and Alaric's decision to honor Caroline's mother through the lives of his daughters. You guys, I cried real tears when Alaric saw his girls be born and didn't stop until the credits rolled. By the time he laid those babies in Caroline's arms it was a Category 5 Blubber Fest over here. We all knew Caroline would be okay. We've seen her in the future. There was never a moment where any of us needed to worry about her safety or the safety of the babies. Valerie has completely redeemed herself and can now stay forever as one of the gang. She could have run away with the rest of her Heretics, but she chose to put the lives of the babies ahead of her own personal safety and that of her family and for that she's earned my respect. I won't say I'm totally ready to see her with Stefan in the future, but since we're still not sure how that plays out, for now, props to her for not being a selfish, scared runner. RIP Beau, though. I did sort of like him. Oh well. There are more important characters to think about. 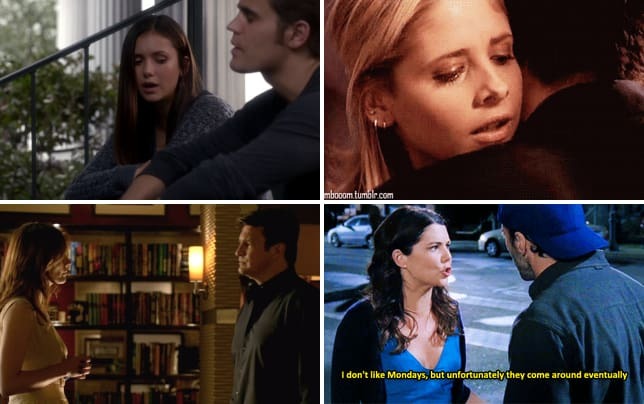 Like Damon, Stefan, and their relationship now that Stefan has to go on the run to protect Damon, Caroline, and basically everyone he cares about. My curiosity around Enzo and these agents in black and his connection to Tyler (and therefore Matt) is at an all-time high right now. Did they plan to kidnap Rayna and somehow turn her into a weapon? Were they planning to harness her anti-magic capabilities and use them for good/evil? What is up? I need answers! But no. Damon finds out Elena's still alive and just...doesn't ask questions. Yes, yes. Elena's alive. (Which we also knew because of the flash forward where Stefan wakes Damon up and he's in a coffin next to Elena's coffin.) Tyler pulled a switcheroo and got his head bashed in on the suspicion that Damon might try something whacky like burning someone in a coma in an airless coffin. Elena's all good so Stefan has essentially taken the tip of Rayna's sword to save his brother from...nothing. Sure, it was technically to save Damon from himself, but in reality, it was for nothing. Symbolic of his vow never to stop saving his brother, but geez, Damon. You really owe Stefan now. We can probably go ahead and blame Enzo and Tyler for not TELLING Damon after the fact that he didn't ACTUALLY burn Elena's body, but still. Now Stefan's on the run and Caroline's right. It's almost always Stefan who has to leave when things like this come up. That's not to say that Damon has never sacrificed for Stefan. He has, absolutely. But it does often seem that Stefan is cleaning up Damon's messes. And what we know is that Damon will, at some point in the next three years, decide to just...take a nap. He'll literally lay down on the job of defeating the huntress while his brother is still on the run. Maybe what will happen is Damon will think he's killed her but because she's essentially a cat and has nine lives, he won't realize he has to kill her more than once in order for her to stay dead. Perhaps someone in New Orleans will be the person to help them put the pieces together. 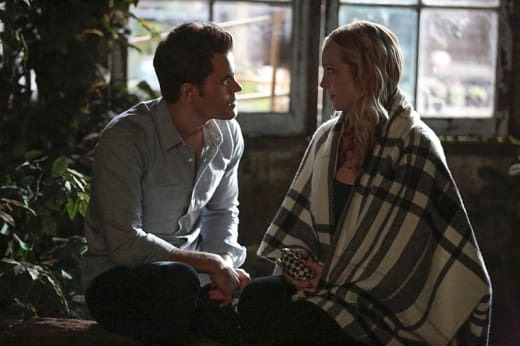 Oh yes, Caroline's headed to the Big Easy to see "a friend" on The Vampire Diaries Season 7 Episode 14. And suddenly my wheels are spinning and I'm wondering if Rayna Cruz is the "monster" Alexis predicted which is more dangerous than the weapon which can kill an Original and still looming on the horizon. I could be totally wrong, but it's a very interesting thought. Huh. You know? You look a lot like my girlfriend and her three doppelgängers. Permalink: Huh. You know? You look a lot like my girlfriend and her three doppelgängers. So many good The Vampire Diaries quotes tonight. So very many. What did you think of "This Woman's Work"? How many tears did you shed when the babies were born? Will Damon be able to stop the huntress? Let's chat in the comments below and don't forget you can always watch The Vampire Diaries online to relive the best moments from this awesome episode!